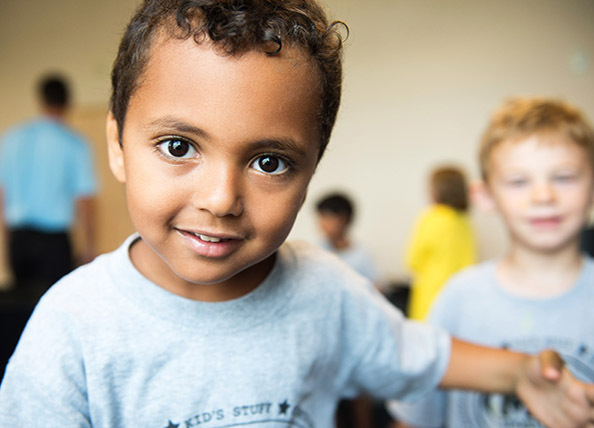 Kid’s Stuff is for children from 0-11 years who are child members of MVP Sportsplex or guests of members. Guests are subject to normal rules, regulations and time limits. The only requirement we have is that children be in tennis shoes (sneakers) for gym play. We prefer that all children wear athletic shoes. Kids will not be permitted if they are wearing crocs, sandals, flip-flops, cleats or boots. Dress your child in play clothes that allow for freedom of movement…and consider too, that paint, playdough, glitter and glue are used in the art area. Please don’t send your children in brand new clothes! Any article of clothing that might be removed should be labeled. Shoes are removed for the Inflatable Bounce House so it is essential that footwear be identified. Velcro sneakers are recommended for small children that don’t yet tie. PLEASE CHECK TO SEE THAT YOUR CHILD IS WEARING THE RIGHT SHOES AT CHECK-OUT! Many shoes look alike! Yes, we ask that you do call ahead if you have a baby under 12 months. If you just show up with your baby, and the infant area is already full, you may be asked to wait until a baby is checked out. We will certainly do what we can to shift staff members around to accommodate your baby, but a reservation will help us prepare from our end. Please call 616-254-8804 even if it’s just as you are heading out of the house to come to the gym! Infant reservations may be made up to 12 hours in advance. We understand that ‘big kids’ sometimes aren’t thrilled about coming to “daycare”. We’ve set aside special privileges for children 8 years and older; they can use Wii games for video gaming, legos and board games- (a great escape if they’ve had too much of the little people!) During open gym hours, from 9:30-11:30am, we split the gym so big kids can have their own space. Many special activities are created specifically for older kids, particularly during the summer. The Kid’s Stuff areas are for children only! If you are new to the MVP Sportsplex, and need to walk your child in the first time or two, that is fine, but as a rule, Club members or visitors without children are not to be in the Kid’s Stuff areas unless they are escorted by a Team Member. There is one way in, and one way out (at the check in desk!) All other doors are alarmed or locked. Unauthorized persons will not be permitted to enter the gated areas, or the gym area.